There was no way I was going to miss Juliette Binoche playing an actress. Not too long ago, I enjoyed her as another type of artist. In Words and Pictures (2014) she played an art teacher in a passionate relationship with a literature teacher (Clive Owen). Metafiction is a huge interest of mine. I’ve read it and written about it in graduate school. Since I love discussing literature, a well-done work based on the process of creating fiction grabs my attention because I get to see the details from a different angle. This is no different for me when it comes to movies that provide the same opportunity. When I heard about Clouds of Sils Maria, the current Best Picture winner (yes, I jumped up and down, as it was my pick), Birdman or (The Unexpected Virtue of Ignorance) (Michael Keaton, Edward Norton, Emma Stone, Naomi Watts, dir. and winner for Birdman, Alejandro González Iñárritu), came to mind—so did All About Eve (1950-Bette Davis, Anne Baxter, Celeste Holm, dir./wr. Joseph L. Mankiewicz) and, of course, Annette Bening’s Academy Award-nominated performance in one of my favorite films, Being Julia (2004-Jeremy Irons, Shaun Evans, dir. István Szabó). 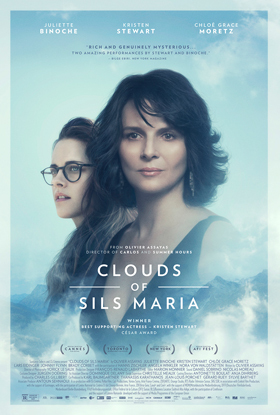 But Clouds of Sils Maria has an extra “meta” element that is quite intriguing, and it involves the relationship between Maria Enders (Binoche) and Valentine (Kristen Stewart), her personal assistant. As Valentine helps Enders run lines (the most wonderful parts of the film for me), that element comes out in the most profound ways, emotionally and psychologically as the characters go, and in the brilliant performance of Binoche as she gives herself away to the character her character plays. It is an astounding actress playing an astounding actress. Valentine (Stewart gives a great performance here) challenges Enders, and the interplay is electrically engaging. Meanwhile, Enders, an actress in the second stage of her film and stage career, faces the new guard while enjoying her legendary status and dealing with the challenges of what decisions to make heading into her present and her future. She is apprehensive about accepting a role in a revival of a play she did in the past, but as a different character–the older one–at the opposite end of a complicated relationship. Where Enders ends up is satisfying because it is realistic, although I, as someone not familiar with writer/director Olivier Assayas’s work, was not expecting it because I didn’t allow myself to hope for such satisfaction. I should have. But either way, Clouds of Sils Maria had won me over from the start.